It's my honor to witness the birth of Rubik's Dream by Henry Harrius. So many trial and error lead to this very best props show in front of you. If you want a perfect Rubik's Cube Miracle. This is it! Best of all, Henry will teach you part of his FISM act, an effect which fool hundreds of magicians and made him the second runner up in FISM Rimini 2015! 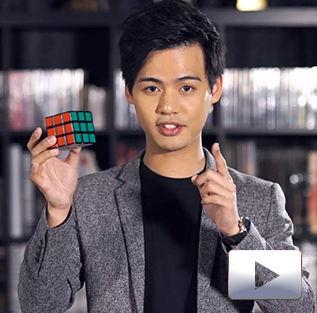 My highest recommendation trick of the year of close up magic, especially magic with Rubik's Cube. I had the absolute honor to session with Henry while he was in Singapore recently for his lecture tour, and it was a phenomenal moment for me while playing around with the cubes. Quality is simply unreal and Henry's attention to detail is just superb. So much possibilities can be achieved through this, only enhanced by the superior quality that this product carries. I think this is one pivotal moment for magic cubers and really elevates the ground for future rubik cube projects. The video tutorial is super detailed and clear, leaving no stones unturned. P.S. You'll be fooled over and over again, even though you know what's the gimmick at work. Henry's construction into the routines are well thought-out and motivated. No wonder he's a FISM winner! Vincent Kuo's Block Solve is a great bonus included in the download, and should be practiced and performed by anyone that does cubes. It's essentially taking Steven Brundage's Imagination Solve from Cube3, and making it all compact with no unreasonable motion. Plus, it's surreal to see it in person. You just gotta see it to believe it! Can't recommend it any higher. Top praises! Honest and fair. I don't have the items but my comment is about the fantastic trailer: is there any other magic company that has such honest and fair trailers? You know the usual stuff: angle set-ups that are not realistic? Taptic pace so you really don't view the workmanship? Over statements?But watch this trailer with a its close-ups and slow pace of the shots, and detailed explanation for magicians. Vanishing is an honest and fair producer of only the best. This is fun! Why didn't anyone think of this before? I'm having a blast figuring out how I'll work this into my existing Rubik routine. The shell is a perfect tool to use within a Rubik's cube routine. The handling at first glance seems awkward, but after playing with the switch for just a few minutes, it's as if you've been doing it for years. There is no fumbling, no fooling around, no moment where you need a small stage explosion to do the switch...it's pretty much a dream come true (pun very much intended). If this even seems remotely interesting to you, pick it up. But fair warning, restrain yourself from ditching everything you already do in order to make room for more Rubik's Dream routines. Don't overlook this just because the RD360 is available! There are things you can do with this gimmick (faster, less covered loads, some effects and displays similar to Enchanted Cube gimmicks, and of course all the effects using the mini cube shell!) that RD360 and Easy Cube can't do! I have them all and, a) I still use this gimmick for things, and, b) honestly a lot of the RD360 routines would still work with this gimmick, you just get the extra clean display. I've been doing cube magic for a long time and have always been on search for a shell - this is really an almost perfect one which fools you even on a very short distance! I had never touched a Rubik's cube before I ordered this product, and since I'm almost 70 years old, I was wondering if I would be able to master the "solve." After watching Henry's excellent training video a couple of times, and practicing a few days now, I feel as if I'm starting look like a Rubik's cube expert. I guess you can teach an "old" dog new magic tricks.